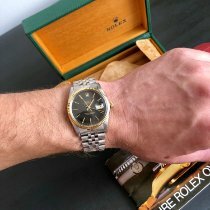 This Rolex Datejust is in great condition and is made of 18K Yellow Gold. It has a light champagne dial that shows signs of aging and is set on an 18K Yellow Gold Jubilee bracelet that measures approximately 7 1/2" including case. The serial indicates a 1962 production date. Watch model number is 1601 and serial is 156*. Watch is water resistant up to 100 meters/10 ATM. Comes watch only! Due to federal laws we are unable to declare a lower value on your package. Due to security purposes we only ship Monday-Thursday unless prior arrangements are made. We do not ship on weekends. 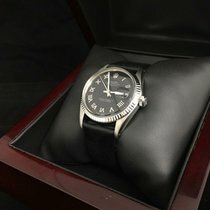 We are not an authorized dealer for any major Swiss watch brand and we do not provide a manufacturer's warranty on any watch bought through us. Phil Abrams Fine Jewelry provides you with an equivalent warranty that reflects the manufacturer's warranty, conditions, and terms. All watches have a 1-year limited warranty exclusively to Phil Abrams Fine Jewelry. The warranty covers the operation and time-keeping ability of all watches that we sell. The warranty does not cover any of the following: accidents, abuse, misuse, neglect, straps, crystals, bracelets, crowns, or cases. 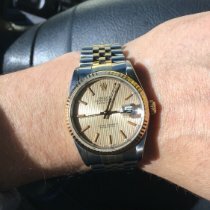 In the event something does go wrong with your watch within 1-year from the date of purchase, the watch would need to be sent back to us for evaluation and/or repair. We use only highly qualified professional watchmakers who are capable of fixing any watch that we sell. Many of our watchmakers are authorized repair centers for many high end watch manufacturers and can easily deal with fixing any watch using only genuine parts. The warranty is void if damage has been caused by opening the case or by repairs performed by someone other than Phil Abrams Fine Jewelry.